Bao Zheng (999-1062), a household name in China, was an outstanding government official and statesman in the Northern Song Dynasty (960-1127). He was born of a scholar family in Luzhou, now renamed Hefei, in Anhui Province. At the age of 29, he passed the highest-level imperial examinations under the direct invigilation of the emperor and qualified himself as a Jinshi. As laws and regulations of that time said that a Jinshi could be assigned a leading position, Bao Zheng was appointed magistrate, the head of Jianchang County. But as filial piety was regarded as a highly valued virtue, Bao resigned his position and went home to attend his old and weak parents for ten years. After his parents' death, he was reappointed magistrate of Tianchang County. That year, he was 40. Bao Zheng proved to be a magistrate of justice, fearlessness and righteousness. His superior wit and talent profoundly impressed people across the nation, including Emperor Renzhong, who successively promoted Bao and assigned him to important offices in various parts of the country. To most Chinese people, Bao Zheng is known for his strong sense of fair play, his determination to mete out justice without fear and favor and his ability to tell the truth from falsehood. He insisted that anyone, including close relations of the Emperor, deserves punishment if found guilty of wrong doings. According to historical records, in the 30 odd years when he took office, more than 30 high officials, including some government ministers, were demoted or dismissed because Bao accused them of corruption, bribery, dereliction of duty, misprision, etc. He was such a firm and resolute man that he never gave up what he thought was right. He reported six times to the Emperor to impeach the high-ranked government official Zhang Yaozhuo, uncle of the high-ranked imperial concubine, 7 times to impeach Wang Kui, another official favored by the Emperor, and several times to impeach Prime Minister Song Yang. What is amazing is that as an imperial censor, Bao Zheng always succeeded in convincing the Emperor without inviting misfortune. In history, many imperial censors came to bad ends. Sima Qian (145 B.C. or 135 B.C. ), a great historian, thinker and litterate, was castrated for a few words for Emperor Hanwu. Wu Kui, Chen Xu, Du Shu, three imperial censors living in Bao's time, all fell off the political stage for their expostulations. Bao Zheng, however, headed off one danger after another and stayed on the stage until his life end. We can't help marveling at this great man's intellect and personality. Bao Zheng's personality was closely related to his early life. Though his parents could afford to send Bao Zheng to school, their life was not so rich. His mother had to climb up the mountain to collect firewood just before she gave birth to him. Before Bao became county magistrate, he had lived among the low working class, which helped him understand their trouble and hardships. He hated corruption and strongly desired for justice and probity. His personality was also attributed to a man named Liu Yun. Liu was a magistrate of Luzhou District when Bao was looking after his parents at home. He was not only an excellent poet and litterate but also a talented and fair-minded official abhorring all evils in the society. He was also a man respecting intellectuals and particularly appreciated Bao Zheng's abilities. As Liu and Bao got along well, Liu exerted great influence on Bao, who cherished loyalty to the throne and love for his country and the people. Now there are many stories and operas about this extraordinary character in Chinese history. Bao Zheng is respectfully called Bao Gong. 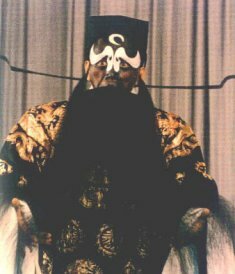 His stern black face, looked upon as a symbol of justice and integrity, is easily recognized by all Chinese opera fans, although this is more theatrical than real. Lord Bao (Bao Gong) was a famous upright officer who lived during the Northern Song Dynasty (960 - 1127), one of the more magnificent periods of the Chinese civilization.